Domestic Sugar: Because Domestic Life is SWEET! : Little Lamb, Who Made Thee? I CAN RUN OUTSIDE AGAIN AND NOT WEAR ONE THOUSAND LAYERS! It is so amazing to finally be able to go outside and see everything melting. Sure, there is dog poop everywhere, and it's hard to go for walks for fear of being splashed by cars, but the final result of glorious sunshine makes it all worthwhile. I love Summertime in the Fort! We're so close! Anyway, I have spring fever. My windows are all open and I'm cleaning up, getting ready for summer. To celebrate, I decided to do a cookie. It has been a long time since I've actually taken my time on a nice looking decorated cookie! 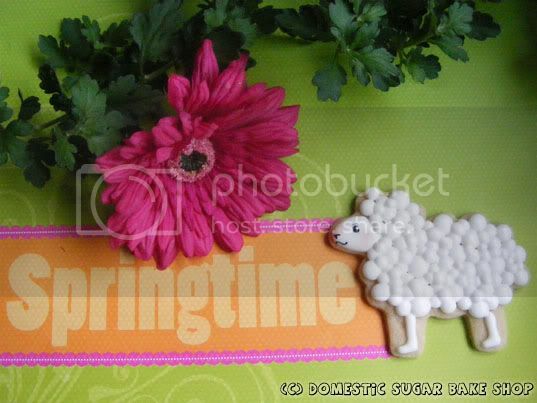 To honor spring, I made cute little spring lambs. Yes, yes, they look like sheep to me too, but let us use our imagination for a while. Look, all bubbly-cute! I made a few types of lambs to figure out how I wanted to decorate them, in the end, these lambs were the nicest (other than flat coats and non-peril topped coats). Each bubble is put on, then let to dry (10 minutes or so) then another layer, then another until finally you get this cute bubbly/puffy look. Makes for a great coat! 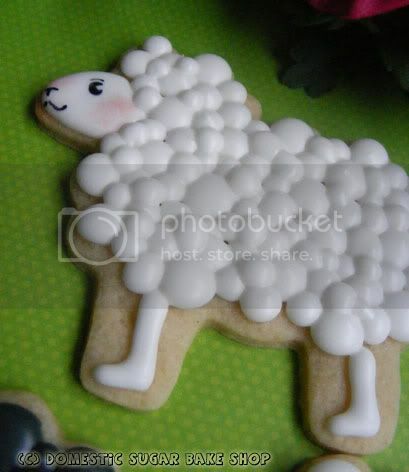 I'm the black sheep in my family :) But I could just as easily be the one below (Scary Lamb). This summer, hubbie and I are building a home on the lake. We are super excited to see all this snow melt so we can get started... TIME IS TAKING FOREVER! Honestly! But, I am confident that it will all go down without a hitch. We just got the blue-prints back from the engineer. HURRAY! I cannot wait to get out there. Hubbie and I went out to the property last month to take photos; there was snow up to our waists! Only one more month I'm sure, then all of this will be almost gone! Anyway, rant done. I'll post more more fun ideas soon! Ta-Taa! These are beautiful cookies--they must have taken forever to do, though! These are just adorable! You did a wonderful job! The cookies are adorable, good job! Can I come and visit when the lake house is done? LOL congratulations. Adorable! 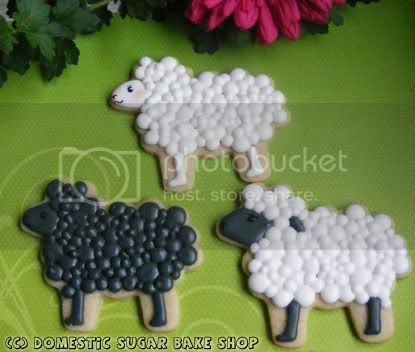 I love the white sheep with the black face. Very cute. I tellya, this idea is outstanding. I love it! adorable! love the black sheep too! So cute! Did you just use royal icing? These are amazing! Love the fur bubbles. Joanna: Yeah, Royal Icing all the way. Instead of a loose flood, I opted for a 5 second incorporation flood. Meaning, the flood will settle into itself after about 5 seconds. The Layer by Layer application means that each bubble dries separate. If you put them too close, you would just get a blob that sticks together (like a thick flood). These are so cute!! I especially love the detail on the faces - such a cute design! Congratulations on building a house! Congrats on the house!!! I love the cookies! Great tip to do each set of dots in layers. Those cookies look fantastic! We are in the begining of Autumn here in Australia, so I'm looking forward to wearing layers! My husband and I are currently doing a large extent ion on our home (he's building and I'm the foreman ;) I'm blogging about our progress, the roof should be on next week!! I hope you get a chance to drop by and have a look. 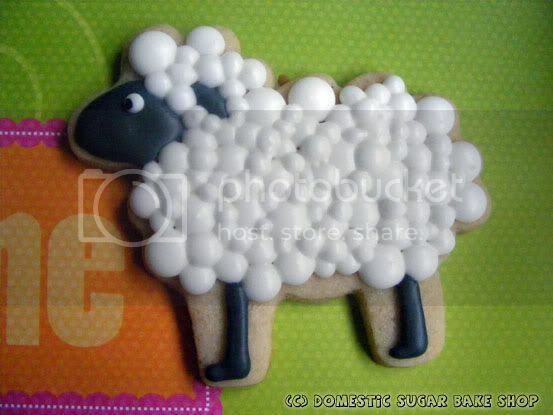 Very cute cookies :) they look too adorable to eat. Thanks for sharing. So cute I want to try making them. Where did you get the cookie cutter? I love all your cute ideas. Wow, these are adorable! love your creativity! Your cookies are beyond cute! Perfect for springtime!!! Thanks for linking up to I'm Lovin' It! I featured your post in my wrap up! http://tidymom.net/2011/easter-treats/ Happy Saturday! wow. this is incredible. I love the way you frosted. incredible. You must have a ton of patience. Very nice job, love the lambs. How precious (and yummy looking) are these cookies! These are so adorable! I saw these on Sweets for Saturday and had to pop over. Precious little lambs! You did a beautiful job decorating them! I hope you stop by the Tuesday To Do party and share it! Sheep Lamb it dosen't matter they are adorable!!!!!! those are darling! What tip did you use to make the bubbles? Hi...I am beside you at Show and Tell Friday. I'm your newest follower...what a fun blog. I think these cookies are so adorable. You obviously have a lot of patience! Come visit my blog if you have time. I'm going to look around some more! These are amazing! And good luck with the lake house adventure - sounds exciting! i wish i had known about this when i had my son's sheep party last year! these ane incredible! where did you find that fantastic sheep cutter? i searched and searched and did not fine one as cute as that! Just saw these darling cookies. I am making lambs for a baby shower and would love to do the dots like you did. Did you make the flood frosting thicker than usual? Sometimes when I do big dots I get some indents forming when they dry...so I'm needing advice on how to prevent this. Also....what tip size did you use for the dots! Your cookies are incredible!!! Thanks so much for sharing! amalia: I did make my icing thicker than most floods... I do a 5 count until blended icing. That just means that once you stir the icing, you have a 5 second count until it settles down. I used a regular #2 tip, and just made dots of various sizes. Let them dry in between. That's the key! It has a lot to do with density of the icing, and air bubbles. Make sure you let your icing rest a little with a damp cloth over it so the air bubbles can surface, then tap the bowl to pop them (saves time). The icing should be very thick, but thin enough to spread. It takes just the right type to make this work. Hope that helps. These are beautiful! Great job. I hope you'll link up to my Hippity Hop Easter Project Hop. Adorable cookies! Very nice job! I'd like to invite you to share this with our readers for Fun Stuff Friday @Toys In The Dryer http://www.toysinthedryer.com/2012/03/fun-stuff-fridays-16.html.